NRC Fast track or Cul-de-sac? But recommendations that are not implemented provide zero protection for Americans. They also provide zero excuses for the federal government against accusations of negligence if a nuclear disaster happens here. It’s hard to tell survivors that every reasonable step to protect them was taken when you have a list of a dozen problems you haven’t fixed.Now that its Task Force has identified measures to better protect Americans, the NRC’s Commissioners must decide whether to route them onto the fast track the agency uses for nuclear business matters, or instead into the cul-de-sac it uses for nuclear safety issues. These two paths—if a cul-de-sac can be called a path—are illustrated in the NRC’s semi-annual reports to Congress. In its June 2, 2011 report, the NRC informed Congress that it completed 988 licensing actions in 2010. —in other words, nuclear business matters. Exemptions from regulations, relief from inspection requirements, and enforcement discretion are clearly not nuclear safety issues. Licensing actions allow plant owners to boost profits by not having to do costly things like comply with federal regulations and conduct safety inspections. This is the NRC’s fast track. This same June 2011 NRC report also updated Congress on the NRC’s efforts to resolve 5 generic safety issues. The “baby” among these 5 safety issues has now sat unresolved for over 6 years. 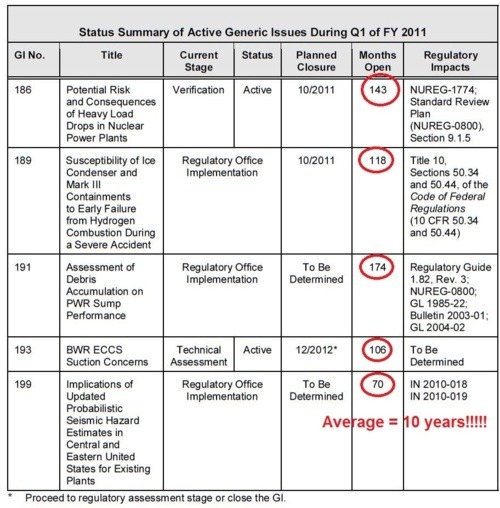 The NRC has been “working” on the oldest of these 5 safety issues for nearly 15 years. The average time these 5 generic safety issues have waited to be resolved is 10 years. (See Figure 2 for the 5 issues). This is the NRC’s cul-de-sac, also known as the road to nowhere. The NRC should be embarrassed by concentrating agency resources on nuclear business matters and only working on nuclear safety issues in its spare time. The American public deserves far, far better than this pathetic performance. The NRC Commissioners are appointed by the President. The US Congress sets the NRC’s budget. The President and the Congress must compel their agency to implement the safety fixes recommended by the NRC Task Force using the NRC’s fast track. The cul-de-sac is already overcrowded with safety issues. There’s simply no excuse for the NRC routing another safety issue to that destination.